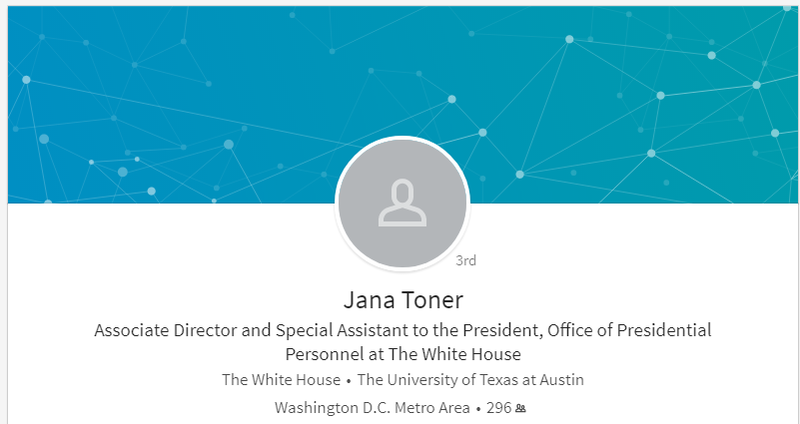 Multiple sources within the White House have confirmed that Jana Toner, a member of the Presidential Personnel Office, is regularly heard publicly insulting prominent pro-Trump media figures, including former Breitbart Technology editor Milo Yiannopoulos and Infowars founder Alex Jones. Mrs. Toner has even told White House interns that sharing content from Mr. Yiannopoulos or Mr. Jones’ Infowars on social media is grounds for dismissal. Furthermore, two White House interns recounted how other employees with the Presidential Personnel Office, at the direction of Mrs. Toner, have also threatened to blacklist them from the White House internship program if they have posted anything from Yiannopoulos, Jones, or Infowars on their personal social media accounts. The first line on the White House internship program application demands to know the applicant’s “Contact information and social media accounts,” which in turn allows Mrs. Toner and her staffers use to weed out Trump supporters from the program. One intern, who wished to remain anonymous described experiencing a “chilling effect” after a PPO employee who reports directly to Mrs. Toner declared: “We will search through your Facebook and we will find everything,” and “If you like Milo Yiannopolous or Alex Jones this isn’t the place for you” at the outset of the internship program. That same intern noted that the PPO employee who proclaimed this mispronounced both Mr. Yiannopoulos’ first and last names. This news comes along with the firings of multiple Trump loyalists from the National Security Council by HR McMaster. McMaster was appointed National Security Advisor after the firing to Michael Flynn. McMaster was recommended to the White House by Senator Tom Cotton who has ties to notorious NeverTrump megadonor Paul Singer. Jeb and George Bush loyalist Jana Toner, is currently the Associate Director and Special Assistant to the President at PPO. Toner is leading a behind-the-scenes effort to hire establishment Republicans and DC insiders instead of staff who back President Trump’s American First agenda. Toner has established herself as a prominent anti-Trump presence within PPO, going out of her way to limit the number of Trump campaign employees accepted into the prestigious White House internship program to just three (out of over 100 positions). Toner was heard justifying such efforts on her belief that students who took time off school to work for the Trump campaign are typically not “intellectually qualified” to work as White House interns. Toner is a Bush family loyalist, having served the George W. Bush Administration in numerous capacities. From 2003–2004, she worked as a Special Assistant in the Department of Public Affairs in the Department of Energy under Bush’s first Secretary of Energy and top ally, Spencer Abraham, who was given that Cabinet position after he lost his US Senate reelection in Michigan. While he was a Senator, Abraham had infamously blocked Bill Clinton’s plan to cut legal immigration, for which he was awarded the “Defender of the Melting Pot” award from La Raza, a far-left, open borders group. Toner later went on to work in a number of capacities for Bush’s Department of Education, which oversaw the wildly unpopular “No Child Left Behind” policy, until the conclusion of Bush’s second term. Toner’s ties to the Bush family go far deeper than that — she is married to prominent election lawyer and GOP establishment power-broker Michael E. Toner, a Jeb Bush loyalist who served the former Florida Governor’s failed presidential campaign as his Outside Counsel. Mr. Toner is also a former CNN employee whom the network enlisted as a “delegate analyst” in the build up to the 2016 Republican National Convention as part of the network’s repeated efforts to float the idea of a so-called “delegate revolt.” Toner’s role at CNN focused on the network’s idea of ignoring Trump’s dominant showings in the primaries in favor of party insiders handpicking a different nominee, with Speaker of the House Paul Ryan’s name at the top of the GOP old guard’s wish list. Mr. Toner has also held a litany of elite positions in Washington politics, including Chief Counsel of the RNC (2001–02), Commissioner of the Federal Election Commission (2002–07), and Chairman of the Federal Election Commission (2006). Toner, who since 2011 has been a partner at Wiley Rein, a white-shoe, DC-based law and lobbying firm, is on record boasting about the potential lobbying opportunities in the incoming Trump Administration. Just two days after the real estate tycoon’s stunning upset victory on November 8th, Mr. Toner tweeted “Busy months ahead for K Street: Trumpvictory could mean big business for K Street,” with a link to a Washington Post article. A White House source said that while Mrs. Toner is a Jeb Bush loyalist at heart like her husband, and for practical purposes she is more of a supporter of establishment Republican types within the White House, including Boehner ally Johnny DeStefano and ousted Chief of Staff Reince Priebus. “It’s kind of hard to be a Jeb Bush loyalist when he is totally irrelevant and nowhere near the White House,” the same White House source said, “so she has morphed into a lackey for establishment Republican types within the Trump Administration.” The same source noted that Mrs. Toner’s anti-Trump efforts are part of a larger effort from DeStefano to go behind Trump’s back and hire personnel loyal to himself instead of President Trump and his agenda. These sabotage efforts are a major reason that so many key positions across the federal government are still unfilled over six months into President Trump’s term, as staffers outside PPO have had to become involved in the vetting process, lest PPO fill the entire administration with anti-Trump swamp creatures loyal to the Bush dynasty. President Trump’s new Chief of Staff, retired General John Kelly, is eyeing a significant White House shakeup, and PPO is one of the areas he is focusing on specifically.